Defending champions Australia will get their series defence underway against South Africa after the Dubai schedule was announced. Olympic gold medal winners and 2015-16 women's series champions Australia will begin their HSBC World Rugby Women's Sevens Series 2016-17 campaign against South Africa, following the announcement of the full match schedule for the Emirates Airline Dubai Sevens. While Fiji start their men's series defence against Canada, Australia's women start against the invited South Africans and also face USA and Russia, whom they beat 31-12 to win last year's Dubai final. That victory proved the catalyst for a season to remember as the Australians took two further titles in Sao Paulo and Atlanta and overall series success for the first time - a stepping stone to Olympic gold. Olympic silver medallists New Zealand, winners in Dubai in 2012 and 2014, begin their Dubai campaign against Ireland and also face France and Fiji. Les Bleues have finished fourth at the last two Dubai events, while Fijiana and Ireland both helped kick-start the 2015 event by upsetting Canada and USA. Canada, who finished third in the 2015-16 series, start against Brazil in pool C, while England and Spain get the action underway in Dubai with the very first match in either the women's or men's competition. 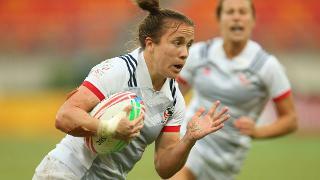 The fifth women's series will also qualify four teams for Rugby World Cup Sevens 2018 in San Francisco, USA in July 2018. New Zealand, Canada, Spain and USA have qualified by virtue of reaching the semi-finals at RWC Sevens 2013 but the top four nations outside of these in the 2016-17 series will secure their places in the 16-team event. The women's competition starts on 1 December with pool matches and concludes with knock-outs on 2 December, the day the men's action starts. Entry is FREE on Thursday 1 December with tickets costing AED 300 (in advance) or AED 400 on the day for both Friday and Saturday (men’s series only). Children under 12 are admitted free. World Rugby Chairman Bill Beaumont said: “With the excitement of the Olympic Games still fresh in people’s memories, anticipation has never been higher ahead of a new HSBC World Rugby Women’s Sevens Series season kicking off. “Dubai always provides a superb setting and atmosphere and it will be fascinating to see whether Australia will continue their gold-medal winning form into the series and whether new challengers will emerge as we begin the road to Tokyo 2020."